BERKELEY, CA (USA) -- The Center for Buddhist Studies at the University of California, Berkeley, is pleased to announce two winners of the 2014 Toshihide Numata Book Prize: Erik Braun, Professor of Religious Studies at The University of Oklahoma, for The Birth of Insight: Meditation, Modern Buddhism, and the Burmese Monk Ledi Sayadaw (University of Chicago Press, 2013), and John K. Nelson, Professor of Theology and Religious Studies at the University of San Francisco, for Experimental Buddhism: Innovation and Activism in Contemporary Japan (University of Hawaii Press, 2013). 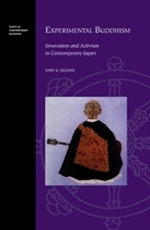 Professors Braun and Nelson will be presented with the Toshihide Numata Book Prize on the afternoon of Friday, November 14, 2014, at the Jodo Shinshu Center in Berkeley (2140 Durant Avenue, at the south west corner of the Berkeley campus). The prize presentation, which will begin at 3 PM, will be followed by two keynotes and a symposium. Insight meditation, which claims to offer practitioners a chance to escape all suffering by perceiving the true nature of reality, is one of the most popular forms of meditation today. The Theravada Buddhist cultures of South and Southeast Asia often see it as the Buddha’s most important gift to humanity. In the first book to examine how this practice came to play such a dominant—and relatively recent—role in Buddhism, Erik Braun takes readers to Burma, revealing that Burmese Buddhists in the colonial period were pioneers in making insight meditation indispensable to modern Buddhism. Braun focuses on the Burmese monk Ledi Sayadaw, a pivotal architect of modern insight meditation, and explores Ledi’s popularization of the study of crucial Buddhist philosophical texts in the early twentieth century. By promoting the study of such abstruse texts, Braun shows, Ledi was able to standardize and simplify meditation methods and make them widely accessible—in part to protect Buddhism in Burma after the British takeover in 1885. Braun also addresses the question of what really constitutes the “modern” in colonial and postcolonial forms of Buddhism, arguing that the emergence of this type of meditation was caused by precolonial factors in Burmese culture as well as the disruptive forces of the colonial era. 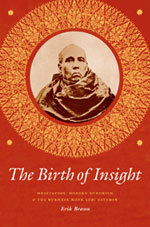 Offering a readable narrative of the life and legacy of one of modern Buddhism’s most important figures, The Birth of Insight provides an original account of the development of mass meditation. Experimental Buddhism highlights the complex and often wrenching interactions between long-established religious traditions and rapid social, cultural, and economic change. Based on ethnographic fieldwork and archival research, it is one of the first studies to give readers a sense of what is happening on the front lines as a growing number of Buddhist priests try to reboot their roles and traditions to gain greater significance in Japanese society. The book profiles innovative as well as controversial responses to the challenges facing Buddhist priests. From traditional activities (conducting memorial rituals; supporting residences for the elderly and infirm; providing relief for victims of natural disasters) to more creative ones (collaborating in suicide prevention efforts; holding symposia and concerts on temple precincts; speaking out against nuclear power following Japan’s 2011 earthquake; opening cafés, storefront temples, and pubs; even staging fashion shows with priests on the runway), more progressive members of Japan’s Buddhist clergy are trying to navigate a path leading towards renewed relevance in society. An additional challenge is to avoid alienating older patrons while trying to attract younger ones vital to the future of their temples. The work’s central theme of “experimental Buddhism”provides a fresh perspective to understand how priests and other individuals employ Buddhist traditions in selective and pragmatic ways. Using these inventive approaches during a time of crisis and transition for Japanese temple Buddhism, priests and practitioners from all denominations seek solutions that not only can revitalize their religious traditions but also influence society and their fellow citizens in positive ways.